Peter fairly exploded with his good news: "It's God's own truth, nothing could be plainer: God plays no favorites! It makes no difference who you are or where you're from-if you want God and are ready to do as he says, the door is open. The Message he sent to the children of Israel-that through Jesus Christ everything is being put together again-well, he's doing it everywhere, among everyone. "You know the story of what happened in Judea. It began in Galilee after John preached a total life-change. Then Jesus arrived from Nazareth, anointed by God with the Holy Spirit, ready for action. He went through the country helping people and healing everyone who was beaten down by the Devil. He was able to do all this because God was with him. "And we saw it, saw it all, everything he did in the land of the Jews and in Jerusalem where they killed him, hung him from a cross. But in three days God had him up, alive, and out where he could be seen. Not everyone saw him-he wasn't put on public display. Witnesses had been carefully handpicked by God beforehand-us! We were the ones, there to eat and drink with him after he came back from the dead. He commissioned us to announce this in public, to bear solemn witness that he is in fact the One whom God destined as Judge of the living and dead. But we're not alone in this. Our witness that he is the means to forgiveness of sins is backed up by the witness of all the prophets." There's a Peanuts cartoon that depicts Lucy and Linus pulling on a chicken wishbone. Lucy is explaining to Linus how the wishbone works, Linus asks, "Do I have to say the wish out loud?" Lucy says, "Of course, if you don't say it out loud it won't come true." Lucy makes her wish and says, "I wish for four new sweaters, a new bike, a new pair of skates, a new dress and one hundred dollars." Linus goes next, "I wish for a long life for all of my friends. I wish for world peace, I wish for great advancements in medical research." At this, Lucy takes the wishbone and throws it away. "Linus," she says, "That's the trouble with you, you're always spoiling everything." Peter's sermon spoiled things for many. The sermon, which we heard from the book of Acts, was preached in the house of a Gentile. This was extremely disturbing to Jewish Christians. Just as disturbing was the fact that Cornelius was a high-ranking officer in the army of the Roman Empire. Cornelius was one of those who ruled. Peter was one who was ruled over. This is a major turning point for Peter and followers of the resurrected Christ. Suddenly, Christ came not for a few but for everyone. Peter realizes that the movement initiated by Christ's life, ministry, death, and resurrection is for all people and he preaches that "God shows no partiality," that "All who fear God and do right are acceptable," that "He is Lord of all," and that "Everyone who believes in Him receives forgiveness." In other words, God's presence from this point forward will bring down fences and barriers that separate us from one another and from God. Unfortunately, we don't live in a borderless world. There are so many things that drive us apart. We live in a world of religious, racial, political, and emotional separation. These invisible borders and barriers separate us even more so than the physical ones. Astronauts tell us that when they look back at earth from outer space there is an absence of artificial borders that separate nations and people from one another. The ecological unity of all of God's creation appears evident. Followers of the resurrected Christ are called to live this heightened vision every day. Christ came for all of creation. Think about it. So then, putting away falsehood, let all of us speak the truth to our neighbors, for we are members of one another. Be angry but do not sin; do not let the sun go down on your anger, and do not make room for the devil. Thieves must give up stealing; rather let them labor and work honestly with their own hands, so as to have something to share with the needy. Let no evil talk come out of your mouths, but only what is useful for building up, as there is need, so that your words may give grace to those who hear. And do not grieve the Holy Spirit of God, with which you were marked with a seal for the day of redemption. Put away from you all bitterness and wrath and anger and wrangling and slander, together with all malice, and be kind to one another, tenderhearted, forgiving one another, as God in Christ has forgiven you. Therefore be imitators of God, as beloved children, and live in love, as Christ loved us and gave himself up for us, a fragrant offering and sacrifice to God. Once upon a time two brothers who lived on adjoining farms fell into conflict. It was the first serious rift in 40 years in farming side by side, sharing machinery, and trading labor and goods as needed without a hitch. Then the long collaboration fell apart. It began with a small misunderstanding and it grew into a major difference, and finally it exploded into an exchange of bitter words followed by weeks of silence. One morning there was a knock on John's door. He opened it to find a man with a carpenter's toolbox. "I'm looking for a few days work," he said. "Perhaps you would have a few small jobs here and there. Could I help you?" "Yes," said the older brother. "I do have a job for you. Look across the creek at that farm. That's my neighbor, in fact, it's my younger brother. Last week there was a meadow between us and he took his bulldozer to the river levee and now it is a creek between us. Well, he may have done this to spite me, but I'll go him one better. See that pile of lumber curing by the barn? I want you to build me a fence-an 8-foot fence so I won't have to see his place anymore. That ought to cool him down. The carpenter said, "I think I understand the situation. Show me the nails and the post hole digger and I'll be able to a job that pleases you." The older brother had to go to town for supplies, so he helped the carpenter get the materials ready and then he was off for the day. The carpenter worked hard all that day measuring, sawing, nailing. About sunset when the farmer returned, the carpenter had just finished the job. The farmer's eyes opened wide, his jaw dropped. There was no fence there at all. It was a bridge, a bridge stretching from one side of the creek to the other. A fine piece of work-handrails and all-and the neighbor, his younger brother, was coming across, his hand outstretched. "You are quite a fellow to build this bridge after all I've said and done." The two brothers stood at each end of the bridge and then they met in the middle, took each other's hand. They turned to see the carpenter hoist his toolbox on his shoulder, "No wait, stay a few days. I've a lot of other projects for you," said the older brother. "I'd love to stay on," the carpenter said, "but, I have many bridges to build." Jesus was the ultimate bridge builder. We can be bridge builders. We build bridges when we practice kindness. Maybe we need to move beyond random acts of kindness to a life filled with kindness in everything we do and say. Think about it. And so I insist-and God backs me up on this-that there be no going along with the crowd, the empty-headed, mindless crowd. They've refused for so long to deal with God that they've lost touch not only with God but with reality itself. They can't think straight anymore. Feeling no pain, they let themselves go in sexual obsession, addicted to every sort of perversion. But that's no life for you. You learned Christ! My assumption is that you have paid careful attention to him, been well instructed in the truth precisely as we have it in Jesus. Since, then, we do not have the excuse of ignorance, everything-and I do mean everything-connected with that old way of life has to go. It's rotten through and through. Get rid of it! And then take on an entirely new way of life-a God-fashioned life, a life renewed from the inside and working itself into your conduct as God accurately reproduces his character in you. When Paul writes to the Christians in Ephesus, he reminds them that they are to abandon the practices of their old life and center themselves in the life of Christ. Paul knows that it is a struggle. It's hard to move from the things we want and desire and to focus on Christ. We struggle to love, to follow, and mirror Christ as we should. Truthfully, we like nothing more than hearing our name or seeing it in print. We are disappointed and even hurt when we are passed over or ignored. Privately we crave to be acknowledged and rewarded. Jean Paul Sartre described it as "En soi et pour soi" (In myself and for myself). Paul says that when we let Christ in that we are renewed from the inside out. When we allow Christ to be our guide and partner in all things we are transformed into that which we were created to be, a child of God whose light pushes back the darkness and brings renewal and hope into the world around us. Think about it. Donald Miller, Blue Like Jazz: Nonreligious Thoughts on Christian Spirituality (Nashville, TN: Thomas Press, 2006), 21-22. Imagine Jesus walking through Clemmons, N.C. What would He think as he passes Clemmons United Methodist, Clemmons Baptist, Clemmons Presbyterian, Clemmons Moravian? What would run through Jesus' mind as he passes the other churches in the community? In this mix of congregations there would be rich, poor, conservative, and progressive. There would be single persons, families, young, and old. Many churches would be welcoming, others not so much. How would Jesus feel as He thinks about all the opinions, closely held beliefs, and the things that divide and separate us into different sects, churches, and faith practices? If you could ask a first century Christian, "are you going to church this Sunday?" they wouldn't know what you were talking about. The church was not a building. It was not a place that they went. It was a movement. It was people. We forget that we do not "go to church." We are the church. 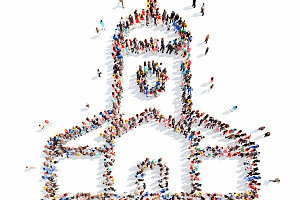 The church is not a denomination or sect, or a group, it is people. One of the ways that we stay true to our calling as people of God is to remember that we are a holy place with a holy responsibility. When I think of Holy, I think of the character of the individual and also the character of the Body of Christ as a whole. The Apostle Paul reminded the people of Ephesus that they were "called to be Holy" through the process of personal and communal transformation. To be Holy, Johnson says, is even more than the growth of individual saints. It is also community, the Body of Christ in the world witnessing to the power and presence of the resurrected Christ. To be Holy is Jesus in the world every day. Think about it. Luke Timothy Johnson, The Creed: What Christians Believe and Why it Matters (New York, NY: Doubleday Books, 2003), 267. A Message from Pastor Clark - join us at 8:30, 9:45 or 11:00 this Sunday! How would you define "Grown-Up Christianity"? Some might lean toward proclaiming the truth of the Gospel, abstaining from sin, seeking personal holiness & upholding Scripture. Others may lean more toward showing grace to all, instigating social justice and being a welcoming presence. John the apostle, who knew Jesus firsthand, says this about Jesus in John 1:14 - And the Word became flesh and lived among us, and we have seen his glory, the glory as of a father's only son, full of grace and truth. Did you notice that last bit about grace and truth? Jesus' very presence manifested such powerful and equal measures of both grace and truth that John was motivated to record it in his gospel. If it was that important to John, so it should also be with us. In a world that continues to force us to choose between grace or truth, let us be reminded that we follow a Savior who didn't choose between grace or truth. He was comfortable with the tension of both and so should we as His followers. Because if we let go of that grace/truth tension and vacilate to one side or the other, we miss something monumentally important about Jesus' love. Grown-Up Christianity Loves like Jesus. Grown-Up Christianity is full of grace and truth. I greatly look forward to sharing this message with you this Sunday at 8:30, 9:45 and 11:00. Please join us for worship and invite a neighbor or friend!